Click like to become our fan on Facebook and get updates about Archimedes' contests, features and other cool stuff! develop your zen mind, your logical thinking and imagination skills with original intuitive paradoxical twisters and puzzles, and intriguing 'koans'! Chess players will appreciate this new entry... The problem is to find a tour of a knight on particular chessboards. Only valid moves of a knight are allowed and every square of the board must be visited exactly once! We are proud to announce our latest works on optical illusions: Eye Tricks and Make Your Own 3D Illusions. We really hope you will enjoy them! Our ancestors knew all about optical illusions, even if they didn’t always recognize the cerebral mechanisms that created them... A place where to discover some interesting early visual illusions! How to focus attention? Give a desire to participate? Encourage creative exploration? ...We've updated and extended our Workshop page featuring interactive educational proposals for museums and institutions. Our experience in the field of human perception and visual creativity has lead us to the publication of two new puzzling books: "MateMagica" and "New Optical Illusions", in order to share our discoveries with our readers. A new gallery has been added to our optical illusion section. Puzzling visual illusions for everyone: beginners and experts as well... Each month, new images are being added but the old ones are archived into a large database. We've redesigned and updated our Tangram puzzle section. The challenge of the Tangram lies in the ability to arrange 7 pieces into a variety of shapes... Who really invented the Tangram? What is the Chinese name for Tangram puzzle? More than 5 pages full of original puzzle ideas, activities and figures to match. It worths a visit! A metaphorical encyclopedia of our world, a visionary tale of mankind, or an hallucinatory journey through our fears? No, just a diverting and surrealist book written in a florid script, entirely invented and completely illegible, and illustrated with watercolor paintings representing strange objects and scenes. Texts in original language of early puzzle authors for you to download: Peano, Alberti, Alcuin of York, Da Vinci, etc. A new "old" puzzle to solve online. The "15 Puzzle" consists of 15 squares numbered from 1 to 15 which are placed in a 4x4 box leaving one position out of the 16 empty. The goal is to reposition the squares from a given arbitrary starting arrangement by sliding them one at a time into the configuration shown above (for some initial arrangements, this rearrangement is possible, but for others, it is not). 3) and an incredible loquacious Robot (called Guigui the A'Bot) you can chat with for hours! What's a Droodle? A droodle is a doodle riddle, i.e. a combination of a doodle and a riddle... Droodles were known for centuries but were popularized by Roger Price in the 1950s. These cartoons were rather abstract drawings of a few lines accompanied by an implicit question: "What is it?". A punch line (usually a funny description) made the cartoons obvious. In this new page a typical packing problem is presented. A set of blocks completely fills a given space, but nevertheless, an extra piece can be added! Magic? You can make your own Paradoxopiped puzzle just by following the short instructions shown on the page. Enjoy! 3) Zeller's formula that allows you to calculate a day of the week for any date. We have updated the pages featuring kinetic illusions. You will find there new images and an original article on the rotoreliefs - optical discs created by Marcel Duchamp - which produce the illusion of motion in perspective. There are a lot of good ideas for exploring the world of optical illusions! The color test featured in this page is designed to give a quick assessment of color vision. The results of the test may be interesting but are not to be considered a valid medical test for color deficiency and merely serve to illustrate the tests available. The original card version of this test was invented by Dr Shinobu Ishihara. We expanded the Moiré patterns page with new original images and drawings you can download for your web pages (but please credit us, a link back would also be appreciated!). In short, moiré is interference that can be seen when overlaying similar patterns. Just as the fine hairs of the Angora caused patterns, geometric patterns such as Circles, Parallel and Radial Lines, or Points also do. A new feature: "Unsophisticated Science Lab" will enrich Archimedes' Lab site soon... These new creative and hands-on activities will stimulate the neurons of our puzzle fans; to know more about this new topic keep visiting us! MATEMAGICA blackline masters for making over 25 funny math puzzles! A collection of incredible puzzles and optical illusions with easy-to-follow instructions (in Italian). Ideal for math workshops. 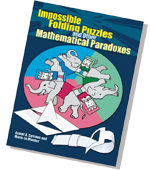 Impossible Folding Puzzles & Other Math Paradoxes is filled with superb, colorful puzzles, all designed and drawn up by Archimedes Lab, the Italian puzzle and illusion creator. Do all problems have solutions? Is complexity synonymous with difficulty? This original collection of mathematical puzzles and paradoxes proves that things aren't always what they seem! Readers will discover that nothing is as easy or as difficult as it looks and that puzzles can have one, several, or no solutions. Mudd Math Facts for math lovers. Puzzles workshops for schools & museums. Editorial content for the media & publishers. Puzzling visual illusions for everyone: beginners and experts as well!